Laundry detergent is one of those things that you simply have to own in order to properly clean clothes, but if you’re someone that likes to use only products with all-natural ingredients, finding a detergent along these lines can sometimes prove to be a big challenge. Natural laundry detergent that works didn’t used to be a thing you could get, but thankfully, this is finally starting to change. The market for natural laundry detergent is expanding rather quickly, and there are now more options available to you than ever before. Detergent no longer needs to be filled with harmful chemicals and ingredients to clean your clothes, and while we would have liked to see this market grow sooner, it’s still great that it’s finally matured as much as it has. However, even with this being the case, finding all natural laundry detergent can still be a challenge if you aren’t entirely sure where to look. Thankfully, we’re here to help with that. The first detergent we’re talking about is Seven Generation’s Natural 4X Concentrated Laundry Detergent. This is one of the most popular natural picks around, and a lot of preppers have quickly taken to this as their go-to natural laundry solution. 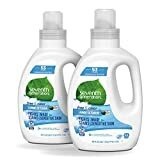 Seven Generation’s deterrent uses a triple-enzyme formula that fights stains with a tremendous amount of power, and those with sensitive skin will be happy to know that it’s also hypoallergenic! The 4x concentrated solution allows you to wash 53 medium loads per bottle, and the inclusion of two bottles with this particular offering means that you’ll get a total of 106 washes! Add all of this together with an EPA Safer Choice Certification and USDA Certification, and you’ve got just about everything you could ask for. Mrs Myer’s is another popular brand when it comes to all-natural products, and this is a great alternative to Seventh Generation if you’re looking to get more loads out of a single bottle. This is a 2x concentrated detergent, and it features ingredients that are 97% naturally-derived. The detergent is also biodegradable, and the HE compatibility rating is always something that we like to see. You won’t find any phthalates, chlorine, artificial colors, parabens, or anything else along those lines with Mrs Myer’s detergent, and that’s the way it should always be. There’s a honeysuckle scent here that is described as being “not only sweet and pleasant, it is said to be calming, soothing, and cooling. 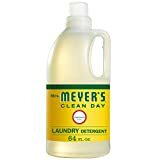 Nice for both you and your home.” You’ll get 64 loads out of a single 64-ounce bottle, and Mrs Meyer’s kick things up a notch with 25% post-consumer recycled packaging. Awesome! Next up is Biokleen Laundry Liquid. This isn’t quite as popular as what Seventh Generations or Mrs Meyer’s are selling, but when it comes down to sheer performance, popularity means absolutely nothing. Biokleen’s liquid is packaged in 100% recycled cardboard and newspaper, and this is a move that we’d love to see other companies take part in. Any sort of recycling that can be done is a step in the right direction, and we have to applaud Biokleen for this initiative. Inside of that packaging is a liquid with a concentration of 3x, and this means that you’ll get something comparable to 64 HE loads and 32 regular ones. Biokleen’s solution does an excellent job at cleaning stains and odors that other products have a hard time removing, and when you combine this with a plant-based formula and citrus aroma, you get something truly special. The last two products on our list are laundry powders rather than proper detergents, but they’re so awesome that we had to include them anyways. Laundry powder works in the same general manner as liquid detergent, but it has the form of a powder rather than a liquid. 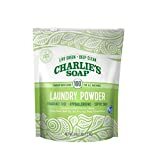 In any case, Charlie’s Soap features a concentrated design and scent-free powder that cleans your clothes with maximum strength without adding any unwanted smells you may not want. Charlie’s Soap is also hypoallergenic, and for people with super sensitive skin, this is a fantastic product. Charlie’s Soap is non-toxic, completely biodegradable, and it’s safe to use with all kinds of clothes and fabrics. No matter if you need to clean silk, wool, linen, or cotton, this has your back. You’ll get 100 loads by default, but if you know you’ve got to do a lot of cleaning, you can get a package that allows for a whopping 300 loads. 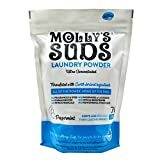 Last but not least, the last item on our list of natural laundry detergent that works is Molly’s Suds All Natural Laundry Powder. This is another powder with a super concentrated makeup, and this means that it does a phenomenal job at cleaning all of your clothes – no matter how dirty they are. Just a single tablespoon is required for an entire load, and it’s even compatible with HE washing machines. You won’t find any harsh chemicals or preservatives of any kind, meaning that this is a great choice for people with sensitive skin, allergies, and even eczema. Molly’s Suds received an A rating in EWG’s Guide to Healthy Cleaning, and it works extremely well in all sorts of water temperatures, with hard or soft water, and can even be used with machines connected to septic systems. Natural laundry detergent solutions are crazy good these days, and while there are a lot of solid options out there, these are the five that you’re going to get the best possible results from every single time. Both the liquid and powder solutions here are absolutely worth your dollars, and no matter which one you pick, you can rest easy knowing that you’re getting something that’s truly special.